Today at the Cudworth Local History and Heritage Group I wrote up on the whiteboard a set of population figures for the village from 1801 to 1931, I hoped this would provoke some discussion and indeed it did, though not necessarily all of the kind I wanted! The CLHG recently joined the Society for One Place Studies and I needed the data above to start to prepare our 'In Depth' submission to the website. Data for all the towns and villages in Britain and Ireland can be obtained from the Online Historical Population Reports website along with lots and lots of other interesting information. I asked the CLHG members what they thought was the reason for the dramatic increases in the population of the village between 1871 and 1881 (58% increase), then again between 1891 and 1901 (219% increase) and finally between 1901 and 1911 (100% increase). The consensus was the timing of the opening of local pits (collieries). Although Cudworth never had a pit sufficiently on the door step to be named after the village it was, by the end of the 19th century, surrounded by coal mines. There had always been some mining in the area, small bell pits or little drift mines, but the 19th century pits were the real deal, employing hundreds of men and attracting incomers from all over the country when they opened and expanded. Please bear in mind that I am not from Cudworth or even Barnsley so I do apologise in advance if what follows is inaccurate - I am sure of the dates, but when the pits grew, closed, took over others and so on is very complex and the motivation behind the choice of home village for the miners is something we may never know! I used The South Yorkshire Coalfield by Alan Hill for reference. This gives information about just about every pit in the area, but I did find it complicated to find information in as it was arranged chronologically in chunks and there was a separate chapter on the colliery companies which confused me for a while as many of them have the same names as the pits. So in timeline order near to Cudworth we have: Monk Bretton sunk in 1867 and probably expanded in the 1880s as that is when the miners' cottages at Day's Croft were built. 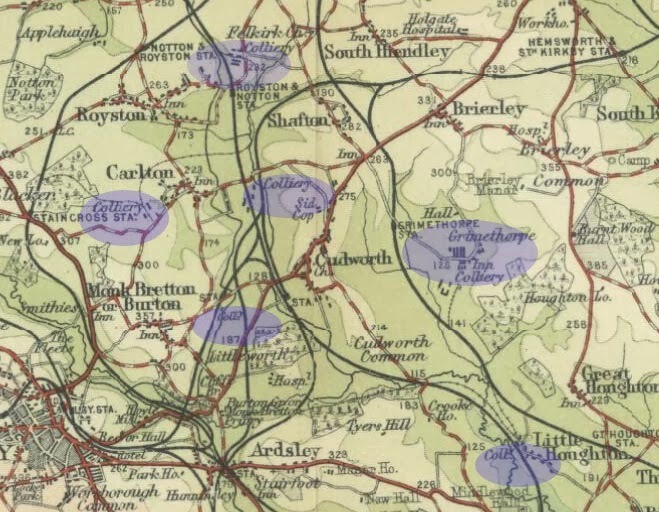 There's a map snip with the colliery and the cottages on my previous post. I have seen families in the Cudworth census returns that started off in living in Monk Bretton and then moved to Cudworth - maybe as nicer, larger houses were built there at the turn of the century. Monk Bretton closed in 1968. Over beyond Carlton was Wharncliffe Woodmoor Colliery - this was opened earlier a bit earlier than Carlton, but is further away than both Monk Bretton and Carlton, nearer three miles to walk in the early pre-public transport days. It was a huge complex of pits though and did not close until the 1970s. Then came Carlton, the pit nearest to Cudworth I think. This opened in 1872 but was worked out by 1909. The company bought other pits nearby: Frickley, Brierley, Ferrymoor and Grimethorpe. Look at the long row of houses to the left of the colliery, not a great deal of imagination went into laying them out I'm afraid. Apparently they were not demolished until the 1970s after the Wharncliffe Woodmoor pits closed, but the colliery buildings appear to have been converted into coke works according to the old maps. There were new houses built in Upper Cudworth on Sidcop in 1876 which may have housed miners working at this pit. In 1875 Monckton Colliery opened one mile east of Royston railway station, to the north of Cudworth and beyond Carlton. A new company, handily called New Monckton Collieries Ltd took over this pit in 1901 and became a very large concern opening several more shafts to extend the workings. If you click on the map above it will open up in a larger window, and you will be able to see the various rows of pit houses, Jubilee Terrace and Monckton Row. I would have thought this was a long way for the miners to go to get to work from Cudworth, but members of the CLHG assure me local men worked there, in later years travelling on special works buses. These collieries came to a close in 1966 for "economic reasons" rather than the exhaustion of the coal. Grimethorpe had opened in 1894 and was taken over by Carlton Main Colliery Company in 1896, so I imagine men who had worked at Carlton could easily transfer there when Carlton closed. The housing for this pit is a bit more convivial - closely packed rows of cottages and a couple of schools are visible in the map snip above. So why would men live in Cudworth? Better houses? Nicer shops? It's a good question. It's very handy for the village - the members at the CLHG have talked about paths across the fields to the pit and tunnels under the railway lines, even special permission to cross the lines. Grimethorpe closed in 1993. Houghton Main, at the bottom of my map snip opened in 1871 and closed in 1993. Frickley Colliery just off the map to the north east at Hemsworth, another pit owned by the Carlton Main Company opened 1903 and closed 1993. 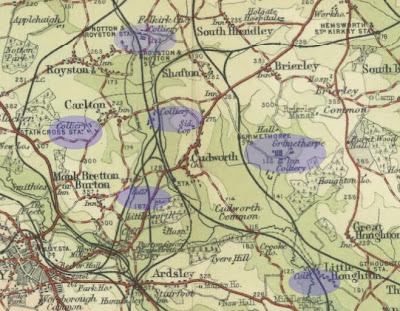 And of course there was Barnsley Main on the edge of the town, at the bottom left of my map snip - but not visible on the Bartholomew map for some reason. It might be there but obscured by all the knotted railway lines and canals in that area! I suppose Cudworth men may have worked there too. Or maybe started there and moved out of the densely packed houses of the town to Cudworth as the new pits opened. So why did the population of Cudworth grow in huge leaps and bounds? The largest increase percentage wise was 1891 to 1901, which fits with the opening of Grimethorpe pit and the expansion of that and the Monckton collieries may account for the doubling in population between 1901 and 1911. It does look as if we can tie most of the growth into the openings of the collieries, but don't forget the railways. Cudworth Station was one of the first in the area and later there were many, many interlocking lines and branches to the collieries to be taken care off. One of the CLHG members told me that most of the people who moved into the New Town estate in Cudworth when it was built in 1922 were railway men. Elliott, B. (2000) Royston, Carlton & Monk Bretton, Stroud, Sutton. Hill, A. (2001) The South Yorkshire Coalfield: A History and Development, Stroud, Tempus. South Yorkshire Archaelogy Service (2008) South Yorkshire Historic Environment Characterisation: Barnsley Zones: Industrial Settlements [Online] Available at: http://sytimescapes.org.uk/zones/barnsley/B11 (Accessed 20 November 2013). Thank you for researching & writing this post. I'm from Cudworth & found it very interesting & helpful. Just amazing that this little village where I was born grew so quickly. I have been researching an elusive Cudworth ancestor and it occurred to me that maybe he wasn't on a census for a reason. I was right. Found his name in an entry in the Wakefield Charities Coroners Notebook which gave me lots of information - details of him saying goodbye to his partner that morning, the lead up to the accident and his death in hospital. He was crushed from the waist down. Information like yours helps to piece together how difficult life was back then. Thank you! Thank you for reading my blog, I am glad you found it useful. I am a member of the Cudworth Local History Group who meet on Wednesday mornings at the Cudworth Centre of Excellence (the library behind the shops). We have a large collection of local old photographs and a small archive of members memorials and stories, cuttings, programmes and other ephemera.